Beautiful scenery, tranquillity, rivers and mountain views will enchant visitors to Myrtleford, nestled in the Ovens Valley with Mt Buffalo providing a dramatic backdrop. The town is a flourishing commercial centre and the hub for the timber, hops and tobacco industries as well as the expanding premium winegrape market. 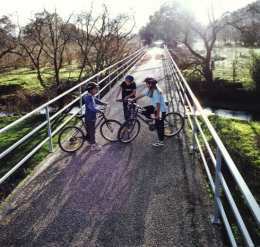 Travelling on foot or by bicycle is the best way to explore Myrtleford and its surrounds. There's a wonderful view of the town from Reform Hill which you can reach via the walking tracks. On the western side of town on the Great Alpine Road is the Phoenix Tree, where, in the centre of its root system you will see the Phoenix Bird sculptured by Hans Knorr. Not far from the Phoenix Tree on Smith Street is the Big Tree, an ancient red gum which was the meeting point for generations of the local Koori people. Visit one of our many parks - Apex Park, Jubilee Park, Rotary Park, Jaycees Park (see the display of old agricultural machinery), Cundy Park (features a fenced-in infants playground and skateboard rink). The Reform Hill lookout provides visitors with views of the Ovens Valley, MT Buffalo and the Victorian Alps. Crops of tobacco and hops give the valley its patchwork appearance. Plantations of Pinus Radiator on the surrounding hills supply timber for the local softwood mill. In winter snow caps the distant mountains. The return walk to the lookout takes about an hour and starts from the JA. Jones Memorial Reserve on the eastern edge of town adjacent to the Alpine Rail Trail. After the walk, why not use the amenities at the Reserve for a barbeque or a picnic? Above the memorial, the track divides to provide two different routes to the lookout, both approximately equal in distance. This is the steeper of the two tracks and will take you past an old ventilation shaft, which once serviced the Reform Mine. It is very steep and despite the fencing, caution is needed around the opening. The track continues in a southerly direction where more sheltered conditions enable tree species such a Red Box and Lang-leaf Box to flourish. Mullock heaps can be seen along the track as well as several shallow surface diggings. The track turns north onto a straight and moderate climb to the summit. Rest stops are provided along the way. Many wildflowers may be seen during the warmer months including grevilleas, peaflowers and orchids. You will possibly encountered Eastern Grey Kangaroos, Echidnas and many birds such a Flame Robins, Pardalotes and Gang-Gang Cockatoos. If using this approach from the memorial one of the first features seen is the town's old water storage basin. Long since abandoned, this small reservoir used to hold water run-off from the hill. The climb follows the drier northerly aspen of Reform Hill and the vegetation changes. Red Stringybark, Red Box and some peppermints can be viewed along the way. Areas of tussock grass and Austral grass-tress are common throughout sections of the walk. All of the forest vegetation seen along the walk is regrowth a the hill was cleared during the mining days to provide fuel and building materials. WARNING! Stay on the walking tracks as there are old mine shafts in the area. Only foot traffic is permitted on the tracks. Trail Bikes, bicycles and horses are not allowed. Enjoy the walks and the beauty of Reform Hill!. 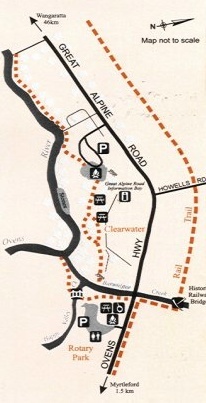 At the Western Entrance of Myrtleford, rediscover the Ovens River and it's environs by enjoying the Clearwater Walk. Approaching Myrtleford travellers are struck by the beauty of the mountains. From these mountains run fresh clean waters forming the rivers and streams, which finally join together to form the Ovens River. This river has been the life blood of Myrtleford since 1837 when the first squatter John Hillas erected his huts and stockyards on its banks. Soon after, miners began to arrive in the region in search of gold. The track the miners hacked along the Ovens River is now the Grew Alpine Road. As more sealers came to Myrtleford, the natural environment was changed under mans influence. Blackberries were introduced in 1870. The plant quickly spread after the miners left the site. In recent times the Ovens Rives 118,5 been inaccessible it the western entrance of Myrtleford due to wend growth. 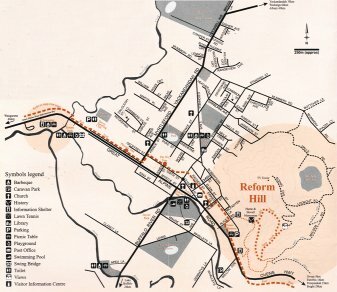 In 1994, the Landcare Environment Action Program (LEAP) Scheme was put before a group of young people from Myrtleford to clear this unused part of the area. After much hard physical work, the area has hero transformed into a park for the family, with tracks allowing you to see the nature of the river and its habitats, and appreciate its beauty. Au park facilities were created using natural materials. Experience the beautiful Ovens Valley by walking or cycling along the Murray to Mountains Rail Trail. This is an old, disused railway line that has recently been converted into a walking and cycling track, and is now available for public use. The track currently extends from Myrtleford through to Bright to the South, and to Gapsted, Wangaratta and Beechworth to the North. Easy gradients and wide curves make the track suitable for all ages, and you will encounter interesting cuttings, bridges and reminders of railway eras. In addition, the railway reserves are ideal corridors for nature conservation. This section of Rail Trail is part of the Victorian Rail Trail Project which is setting the pace in converting "rails to trails". Changed transport needs have left a network of disused railway lines across the state, which offer tremendous opportunities for recreation and tourism. By the time the project is completed, a total of 700 km of disused railway line will be converted to tracks for the public to enjoy. Set at the foot of MT Buffalo, Lake Buffalo is a man-made picturesque lake located on the Buffalo River. It is a part of the Murray System, with a storage capacity of 24,000 ml. It supplies water to Wangaratta and the many tobacco farms and hop gardens in the Buffalo Valley. It is an excellent spot for fishing, boating, swimming and water skiing, and has picnic facilities. 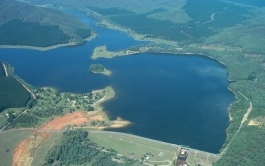 Lake Buffalo is approximately 20km from Myrtleford. Fishing is also popular on the Ovens and Buffalo Rivers, Rose River and Barwidgee Creek.